Jet lag is in full control of me, as are the post-adventure blues. Anh and I just returned Sunday morning from two weeks in Viet Nam, which was such a remarkably moving experience. The country is breathtakingly beautiful from South to North and its people so hardworking, humble, and kind. And resilient. Everywhere you turn, people are building a better future for their families, community, and country as a whole. Seeing where my husband was born and spent the first few years of his life was such an honor. We met some his babysitter, neighbors, and saw where his mother, aunts, and grandmother lived before marrying out to other families and starting their own home. The shack that he was born in is no longer there, but instead the concrete structures that line canals all over the country. The green house behind him is where his family’s home stood. Just beyond the open doors you can see the water. We were struck by the quality of life the people we met enjoy. They don’t have three cars, five flat-screen TV’s, and the trendiest new clothes, but they’re happy. There is a different measure of success and happiness in Vietnam – food on the table, family nearby, and maybe a Japanese motorbike, are most important. 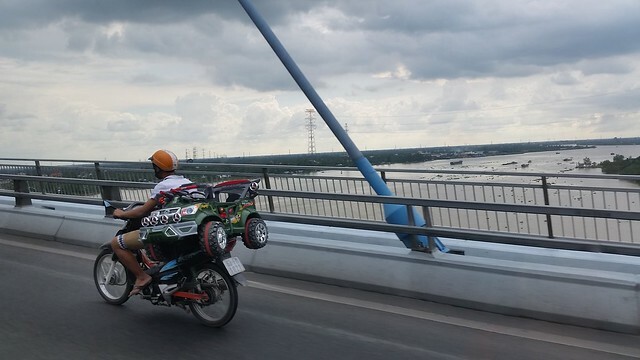 I was constantly amazed at what the Vietnamese people are able to carry on the back of their motorbikes. There is a very happy kid waiting for this special delivery. My father’s number wasn’t called in the draft, so we did not experience the war like many other families did. Still, I was unsure how the people I met would respond to me – an American foreigner in their country with whom we have had a complex relationship. The concern was only in my head. 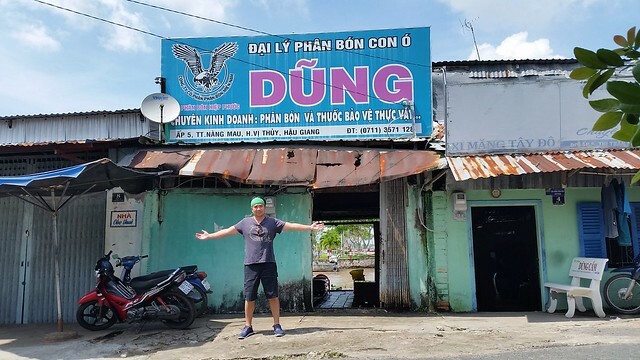 Everyone was so welcoming, warm, and thoroughly impressed (and amused) by the Vietnamese language I have picked up and dishes I prepare at home. Seeing my in laws in their home country, with their people and culture was such a joy. They are totally different people in their own environment and you can see that they, too, are happier when in Vietnam. It has something to do with the pace of life and priorities. They are a hard working people – families grow their own food and find a way to buy what they need that doesn’t come from the land – but they are not stressed. Everywhere we went, our days and nights were filled with conversation and laughter. 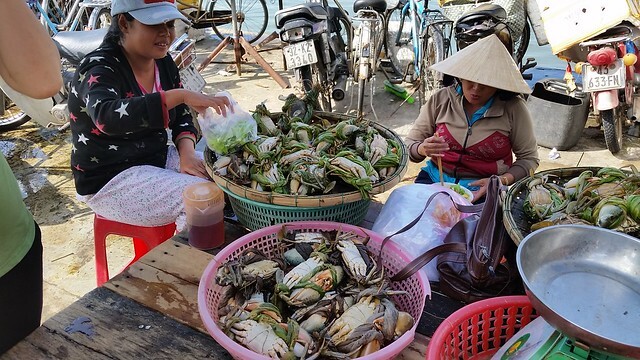 Women selling river crab and having breakfast at the Hoi An Market. We had a conversation with them about the cost of seafood in the U.S., and they of course were amused that I married a Vietnamese. A novelty for many we encountered! We were fortunate to have guides in each stop who were all more than happy to shed light on the community mores, socioeconomic or political issues of the day. Although it is a communist country, everyone we spoke to said it has no impact on their daily life. They are able to do as they please and live their life free from interference. 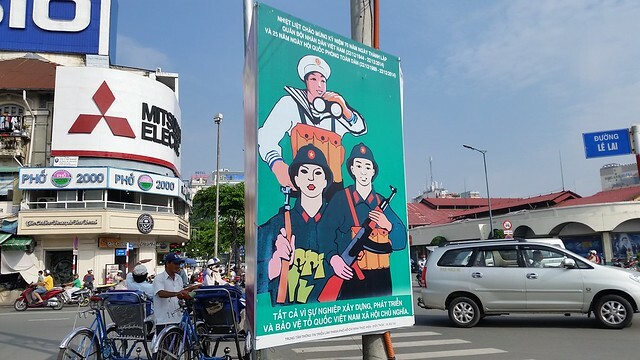 There is no north – south animosity, and any traces of resentment for those who left Vietnam after 1975 has washed away with the rains. 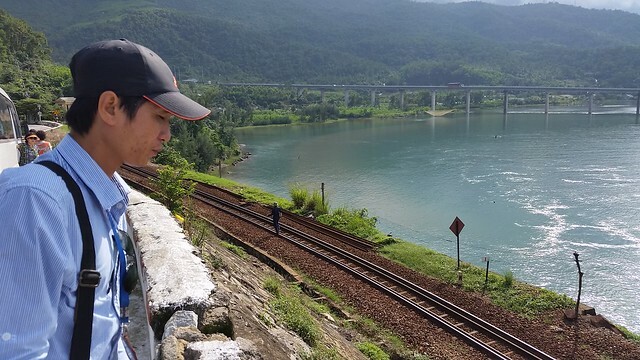 Anh, one of our guides from Ann’s Tours, look out over the water for a quick stop on the north side of the Hải Vân Pass (Ocean Cloud pass). For the first time, my father in law was open about his experience in the South Vietnamese military throughout the war. His stories were matched by others we met from the south and the north who all said that for most, the war was not their own. When they received word that the war was over, they put down their guns and joined the other side in the fields to celebrate together. The post-war road was a difficult one, and families and the land suffered greatly as a result of the conflict, but the people have moved on. As a foreigner, however, it was jarring to see such an overwhelming communist party presence everywhere you turned. There are official facilities in each village, town, and city – always the best real estate and buildings. No one is quite sure why they need to be there as there isn’t a lot of need for the services they provide, but that’s besides the point. 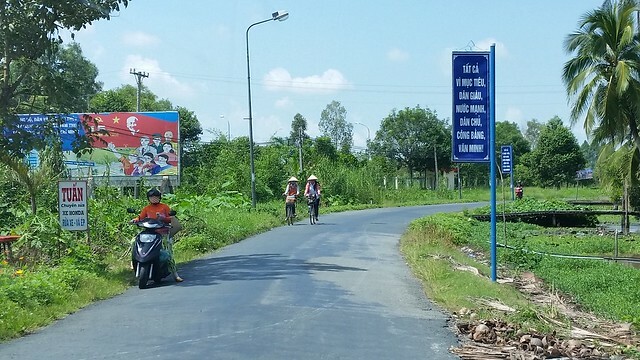 There are roadside banners trumpeting communist philosophy and notable quotes from Ho Chi Minh as you drive through town or along highways flanked by rice fields. Not to mention the propaganda billboards extolling party loyalty and urging people to pursue certain careers or tend to the land. Quite like our own victory garden, war production, and war bond propaganda during WWII. There is a romance about this lush, resilient country that is hard to put in to words. We will definitely be back, and I am excited to see how Vietnam continues to thrive in the future. My only wish is that they do not fall prey to other industrialized nations who almost always seem to lose sight of what really is most important – our family, enjoying life, and how we spend our time with the community. The food of course was amazing, so stay tuned for posts on the cuisine and our adventures from our time in Vietnam! Outbound and return flights are selected and our travel agent is busy finding in-country options for our big trip this fall. But with one minor snag. They won’t book rail travel based on their Vietnamese travel partners who also refuse in saying that rail travel is far too unreliable, so they instead only book in country flights. This article from the Telegraph a few years ago and other photos and video I’ve seen online have me excited to see the country this way. But if it is truly super unreliable – and I don’t mean late by 15 to even 60 minutes – then of course we don’t want our two weeks botched by erratic train schedules. Most of the train schedules I found would have us traveling at night, which can be great, but could also be disastrous if a route is super duper delayed or canceled altogether. Prices seem to be generally comparable from what I can see on Vietnam Airlines, at least. Flights between Saigon -> Nha Trang -> Da Nang (Hoi An) -> Hanoi are each about an hour. So significant time savings, for sure. So who’s been to Vietnam or currently lives there? What advice can you offer a first-timer to make the most of her time? Here are all the places we want to visit in our two weeks, with Hue being the only tentative depending on timing. The starred attractions are obviously not exhaustive, just a couple I had the energy to save thus far. 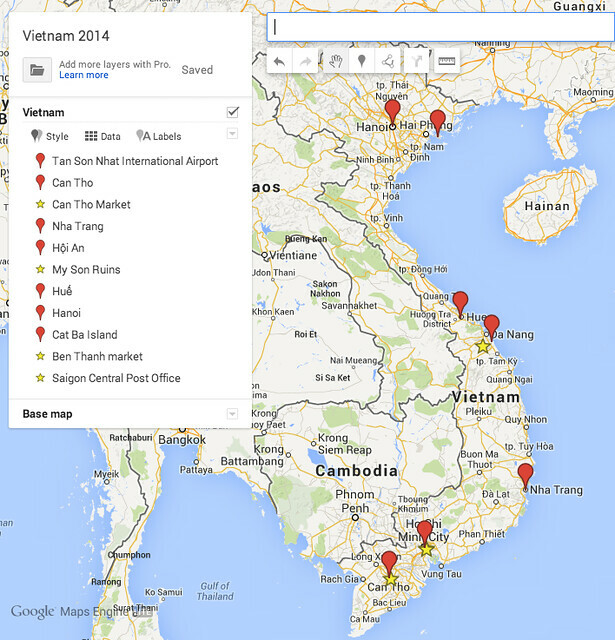 Our big Vietnam trip is finally on the near horizon. We’re booking flights this week and I’m beginning to plan – for real, not just daydreaming – our activities and adventures for the two weeks we’ll spend in my husband’s home country later this fall. Unfortunately it won’t be the big family homecoming trip as we originally thought, but his parents are definitely going and we’ll get to meet some family who is still there. 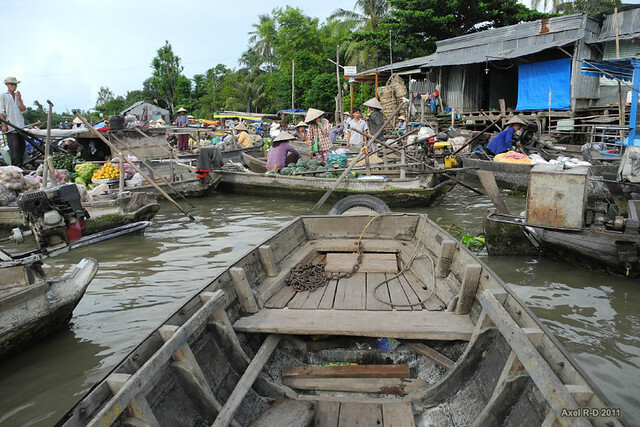 My husband’s family is from Cần Thơ, which has been translated as River of Poems, is a bustling city on the Mekong Delta known for the floating markets. We’ll spend a couple of days there, at least, visiting with family and exploring the floating markets – very excited about that. I’d love to hear from some of you as to what we absolutely must do and see. Any tips about making a structured plan or just winging it once we’re there? We’ll have a few days at the beginning with his family to work things out, as well. We’re definitely going to make a stop in Nha Trang with his parents and relatives from Cần Thơ. Otherwise, I’d love to visit Hue and Hoi An. It may be too much for our time in country, but it would be fantastic to fly up to Hanoi and explore Halong Bay at the end. If we can swing it, we’ll depart from the North rather than coming back to Saigon. I want to see ALL of the places! Help me choose!